Pam Tillis in 2010. Photo by Matt Spicher. 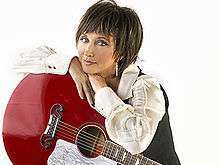 Pamela Yvonne "Pam" Tillis (born July 24, 1957) is an American country music singer-songwriter and actress. She is the daughter of country music singer Mel Tillis and Doris Tillis. Originally a demo singer in Nashville, Tennessee, Tillis was signed to Warner Bros. Records in 1981, for which she released nine singles and one album, Above and Beyond the Doll of Cutey. By 1991, she had signed to Arista Nashville, entering Top 40 on Hot Country Songs for the first time with "Don't Tell Me What to Do", the first of five singles from her album Put Yourself in My Place. Tillis recorded five more albums for Arista Nashville between then and 2001, plus a greatest hits album and 22 more singles. Her only number 1 hit on the country charts was 1995's "Mi Vida Loca (My Crazy Life)", although 12 other singles made Top 10 on that chart. After exiting Arista, Tillis released It's All Relative: Tillis Sings Tillis for Lucky Dog Records in 2002, plus RhineStoned and the Christmas album Just in Time for Christmas on her own Stellar Cat label in 2007. Her albums Homeward Looking Angel (1992), Sweetheart's Dance (1994) and Greatest Hits (1997) are all certified platinum by the Recording Industry Association of America (RIAA), while Put Yourself in My Place and 1995's All of This Love are certified gold. Besides her own work, Tillis co-wrote and sang on the 1990 Warner Bros. single "Tomorrow's World", written in honor of Earth Day, and Dolly Parton's 1992 single "Romeo". She has won two major awards: a Grammy Award for Best Country Collaboration with Vocals in 1999 for the multi-artist collaboration "Same Old Train", and the 1994 Country Music Association award for Best Female Vocalist followed by the CMA President's Award in 1998. Tillis has also received two Recorded Event of the Year awards from the International Bluegrass Music Association. Pamela Yvonne Tillis was born July 24, 1957 to country singer Mel Tillis and Doris Tillis. She grew up in Nashville. As the daughter of country star Mel Tillis, she made her debut on the Grand Ole Opry at age 8, singing "Tom Dooley." She also began taking piano lessons at this age, and taught herself how to play guitar by age 12. At 16, she was injured in a car accident and had to undergo several years of surgery, including facial reconstruction. Following surgery, Tillis enrolled at the University of Tennessee, where she performed in two different groups: a jug band called the High Country Swing Band, and a folk duo with Ashley Cleveland. She dropped out of college in 1976 to work at her father's publishing company, writing the song "The Other Side of the Morning" for Barbara Fairchild. This song charted at number 72 on Hot Country Songs in 1978. Tillis then moved to California and founded a band called Freelight, which played jazz and rock. Upon returning to Nashville in 1979, she had her songs recorded by Gloria Gaynor, Darryl & Don Ellis, Tim Ryan, Molly and the Heymakers and Chaka Khan. After performing in the Bluebird Café in Nashville, she signed to Warner Bros. Records in the early 1980s. Just prior to that, Pam performed with many Nashville 'club' bands including "Cor", Stan Lassiter's "Oceans" and "Strutt" which included a new in Nashville Dan Schafer with Freeman Brown, formerly a Muscle Shoals 'swamper' and member of Nashville's first Motown act "Bottom & Co." on drums. Tillis released her debut single "Every Home Should Have One" in 1981, which did not chart. It was followed by her debut album Above and Beyond the Doll of Cutey in 1983, which did not produce any charting singles either. She charted five more times while on Warner, entering Hot Country Songs for the first time in 1984 with the number 71 "Goodbye Highway", although neither this nor her next five singles were ever included on an album. One of her other chart entries in this timespan, "Those Memories of You", was later a number 5 hit for Dolly Parton, Emmylou Harris and Linda Ronstadt. Tillis left the label and became a staff songwriter with Tree Publishing in Nashville. As a staff writer, Tillis shifted her focus to contemporary country. Tillis started making regular appearances on The Nashville Network's Nashville Now, a variety show hosted by Ralph Emery. Pam Tillis singing on Tuesday, August 15, 2006 at the 2006 Missouri State Fair. Tillis opened the show for George Jones. In 1989, Tillis signed with Arista Nashville. Her first Arista single, "Don't Tell Me What to Do", was released in December 1990, peaking at number 5 on the country charts in early 1991. It was included on her debut album Put Yourself in My Place, which was co-produced by Paul Worley and Ed Seay. It included additional Top 10 hits with the second and fourth singles: the Paul Overstreet co-write "One of Those Things" at number 6 and "Maybe It Was Memphis" at number 3. Tillis had previously cut these two songs while on Warner in the 1980s. The album's title track reached number 11, and the last single, "Blue Rose Is", peaked at number 21. The album was certified gold by the Recording Industry Association of America (RIAA). Alanna Nash of Entertainment Weekly gave the album a B+ rating, saying that it "shows how well she can craft smart and sassy country material[…]and also sell it with a commanding, big-voiced presence". 1992's Homeward Looking Angel produced the Top 5 hits "Shake the Sugar Tree" and "Let That Pony Run". On the former, Worley incorporated the demo version, sung by Stephanie Bentley, into Tillis's recording. These songs were followed by "Cleopatra, Queen of Denial" at number 11 and "Do You Know Where Your Man Is" at number 16. It also included a duet with Diamond Rio lead singer Marty Roe titled "Love Is Only Human", and the song "We've Tried Everything Else", later covered by Michelle Wright. This album was also certified gold, reaching number 10 on the Top Country Albums chart and number 69 on the Billboard 200. Nash gave it a C+, calling Tillis's vocals "irritatingly in-your-face". In 1993, she won her first major award from Country music, winning the Country Music Association' Vocal Event of the Year with George Jones and Friends for "I Don't Need Your Rockin' Chair". The association also named her Top Female Vocalist in 1994. Sweetheart's Dance, Tillis's fourth album, was also her highest peak on Top Country Albums at number 6; it was also certified platinum. The first single, "Spilled Perfume" was a Top 5 Country hit in 1994, and its follow-up, a cover of Jackie DeShannon's "When You Walk in the Room", peaked at number 2. This cover featured backing vocals from Mary Chapin Carpenter and Kim Richey. After it came "Mi Vida Loca (My Crazy Life)", Tillis's only number 1 single on the county charts. The album's next single, "I Was Blown Away", made number 16 before Tillis requested that it be withdrawn as a single, as she had received calls from fans who expressed concern with its title after the Oklahoma City bombing. Its replacement was "In Between Dances", which became a Top 5 hit by year's end. In late 1995, Tillis released All of This Love, which was certified gold by the RIAA. She produced the album with audio engineer Mike Poole. It gave her top 10 hits in "Deep Down" and "The River and the Highway". Also included on it were the number 14 "It's Lonely Out There", which she wrote with then-husband Bob DiPiero, and "Betty's Got a Bass Boat", which spent only four weeks on the country charts and became her first Arista single to miss the Top 40. Also included on the album was a cover of Bruce Hornsby's "Mandolin Rain". Billboard rated the album favorably, saying that Tillis "continues to mature as a singer". Greatest Hits followed in 1997. The album featured two new tracks, which were released as singles, "All the Good Ones Are Gone" and "Land of the Living", which both reached the Top 5 in 1997. In 1998, Tillis released Every Time, which she produced with Billy Joe Walker, Jr. Its lead-off single, "I Said a Prayer", reached number 12, while the title track peaked at 38. Jana Pendragon of Allmusic praised Tillis's voice and song selection, although she criticized the "usual overproduction that characterizes Nashville in the '90s". A year later, Tillis charted at number 50 with "After a Kiss" from the soundtrack to the 1999 film Happy, Texas. She was also one of several artists on the collaborative single "Same Old Train" from the multi-artist album Tribute to Tradition, which won a Grammy Award for Best Country Collaboration with Vocals in 1999. Tillis became a member of the Grand Ole Opry in 2000. That same year, she sang backing vocals on Kenny Chesney's Top 10 single "I Lost It". She also appeared on the Opry's 75th Birthday special on CBS, performing an original song she wrote as a tribute to Minnie Pearl called "Two Dollar Hat". She released her last Arista album, Thunder & Roses, in 2001. Its only chart entry was "Please", which peaked at number 22. As well as singing, Tillis has acted in guest spots on television and on stage. In 1998, Tillis felt it was the right time to expand her acting repertoire. She appeared in back-to-back crossover episodes of Promised Land and Diagnosis: Murder on CBS and NBC's L.A. Law. Tillis later said, "My interest in acting started in 1989 when I starred in Tennessee Repertory's 'Jesus Christ Superstar' as Mary Magdalene,". She has also appeared on Broadway in Smokey Joe's Café which ran from 1995 to 2000. In 2002, Tillis was signed by Sony Music Entertainment / Epic Records roots subsidiary Lucky Dog and debuted It's All Relative: Tillis Sings Tillis, a collection of her father's material that finally found her embracing his legacy on her own terms. In 2007, Tillis launched her own Record label, Stellar Cat Records. Her first album, RhineStoned, was released in April 2007. The Two singles released from RhineStoned were "Band in the Window" and "The Hard Way" both sent to country radio in 2007. Her second album on Stellar Cat Records Just in Time for Christmas, was released on November 13, 2007. In 2012, she released "Recollection", a retrospective album. The disc features fourteen re-recorded singles from her time at Arista. Twice divorced, she has a grown son, Ben Asher Mason, and lives in Nashville. Her second husband was songwriter Bob DiPiero, to whom she was married from 1991 to 1998. 1993 L.A. Law Amanda Hopewell Episode: "Bourbon Cowboy"
1998 Promised Land Kate Matthews Episode: "Total Security"
1998 Diagnosis Murder Episode: "Promises to Keep"
2012 RuPaul's Drag Race Herself Episode: "Dragazines"
2012–2013 Nashville Herself Episodes: "Pilot" and "Dear Brother"
1 2 3 4 5 6 7 8 9 10 11 12 Huey, Steve. "Pam Tillis biography". Allmusic. Retrieved 16 July 2012. ↑ Miller, Tiesha (November 2006). "Creating Home". 417 Magazine. Retrieved 17 July 2012. 1 2 Paul Kingsbury; Michael McCall; John W. Rumble, eds. (February 1, 2012). The Encyclopedia of Country Music. Oxford University Press. ↑ McCall, Michael; Hoekstra, Dave; Williams, Janet (1992). Country Music Stars: The Legends and the New Breed. Publications International. p. 173. 1 2 3 4 5 6 7 8 9 Whitburn, Joel (2008). Hot Country Songs 1944 to 2008. Record Research, Inc. p. 422. ISBN 0-89820-177-2. ↑ Oermann, Robert K. (2008). Behind the Grand Ole Opry Curtain: Tales of Romance and Tragedy. Hachette Digital, Inc.
↑ Nash, Alanna (March 15, 1991). "Put Yourself in My Place review". Entertainment Weekly. Retrieved July 16, 2012. ↑ Remz, Jeffrey B. (January 1996). "Stephanie Bentley hopes debut brings chestful of success". Country Standard Time. Retrieved 2007-08-05. ↑ Homeward Looking Angel (Media notes). Pam Tillis. Arista Records. 1992. 07822-18649-2. ↑ Nash, Alanna (30 October 1992). "Watch Me/Lonesome Standard Time/Homeward Looking Angel review". Entertainment Weekly. Retrieved 16 July 2012. ↑ Sweetheart's Dance (CD booklet). Pam Tillis. Arista Records. 1994. 18758. ↑ "Arts beat". The Dallas Morning News. 27 April 1995. Retrieved 16 July 2012. ↑ "Reviews". Billboard. 107 (45): 76. November 11, 1995. ISSN 0006-2510. ↑ Pendragon, Jana. "Every Time review". Allmusic. Retrieved 11 January 2013. Wikimedia Commons has media related to Pam Tillis. "Do You Know Where Your Man Is"
"The River and the Highway"
"All the Good Ones Are Gone"